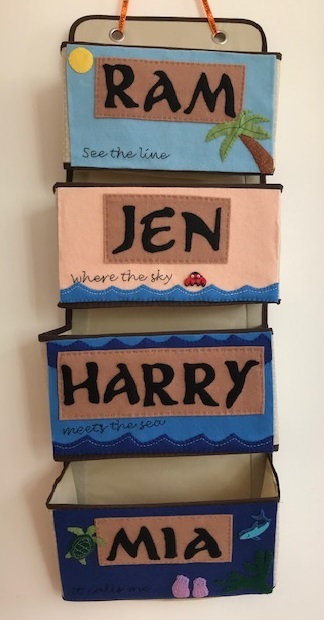 A couple of weeks ago I was lucky enough to visit the US on holiday, and as well as enjoying the tourist attractions we also made the time to visit some craft stores. I love craft stores in the US, they are so much bigger than the ones that we have here and have all sorts of different things that I've never seen before. The prices are also very reasonable, and there are plenty of reductions as well as coupons that make the prices even better. We visited over Halloween and so there was lots of seasonal stock reduced. I bought a few craft kits for the children and also lots of bits which I'm planning to use as little gifts for our planned Halloween Disney cruise next year. The only trouble was making sure not to go overboard and stay within our baggage allowance! Something that caught my eye in the clearance section at Michaels was a Halloween themed diamond painting. I've heard of diamond painting before, in fact I've been offered kits to review here which I've turned down as I've never been very taken with any of the designs. 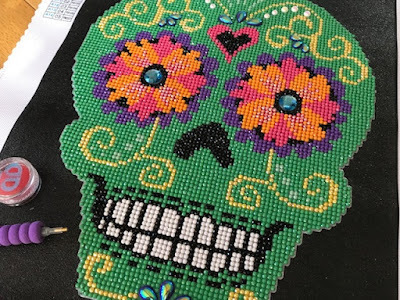 But it was still a craft that I really wanted to try, and when I saw this Halloween sugar skull in the sale I couldn't resist. Despite the name, diamond painting doesn't involve any diamonds. 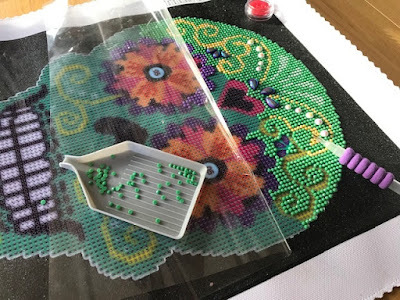 You start with a canvas which has the design printed on in colour, and a selection of tiny plastic 'diamonds'. The canvas is very sticky, and you uncover a small area at a time to work on. Using a special tool, you dip it into a pot of wax, then pick up the diamond and place it in the correct position. When it's finished you place the piece underneath something heavy to make sure that all the plastic pieces are stuck firmly, then you can frame it, preferably without the glass so that the 'diamonds' can catch the light. I very much enjoyed working on this kit, it's a lot like cross stitch or mini Hama beads, but way quicker and very satisfying to put together. The finished picture really catches the light and sparkles. I'm going to pop it in a frame and keep it with the Halloween decorations to put out on display next year! Diamond painting kits seem to be mainly mass produced in China and can be bought online very cheaply from places like Amazon and eBay. The designs tend to be brightly coloured with a hint of fantasy - unicorns and fairies are popular - and not really my sort of thing. I've not seen any other designs that really appeal to me, but I had such fun doing it that I'd love to pick up another kit that is more my style! Ooooo I saw some Christmas cards in our garden centre that were this - wish I had bought one now! They would make great Christmas cards, I've been eyeing some up that I've seen online as they'd make a lovely Christmas decoration for next year too!